(l-r) PRP principal investigator Larry Smarr, co-PIs CITRIS Deputy Director Camille Crittenden of UC Berkeley, SDSC’s Phil Papadopoulos, Calit2/Qualcomm Institute Research Scientist Thomas A. DeFanti, and UC San Diego Physics Professor Frank Wuerthwein. PRP co-PIs who will also be on hand at the award ceremony include UC San Diego’s Tom DeFanti (Calit2/Qualcomm Institute), Phil Papadopoulos (SDSC) and Frank Wuerthwein (Physics/SDSC), as well as UC Berkeley’s Camille Crittenden (CITRIS). In announcing the award, CENIC also noted the “essential technical support” from John Graham at Calit2’s Qualcomm Institute, John Hess at CENIC, and Eli Dart at ESnet. Q. Congratulations to the team, Larry. Why do you think the Pacific Research Platform (PRP) was selected for the award in the Research Applications category? SMARR: The PRP team is humbled by the CENIC award, since without the existence of the CENIC/Pacific Wave backbone connecting many of the West Coast campuses that are in the PRP, we could never have taken on this project. CENIC is perhaps the best regional optical network in the world, being virtually invisible to millions of users because of how well it is engineered and operated. But at the end of the day, CENIC is an enabler, so I think what the Pacific Research Platform has added is to bring many multi-campus Big Data scientific and engineering applications onto the CENIC/PW backplane.. 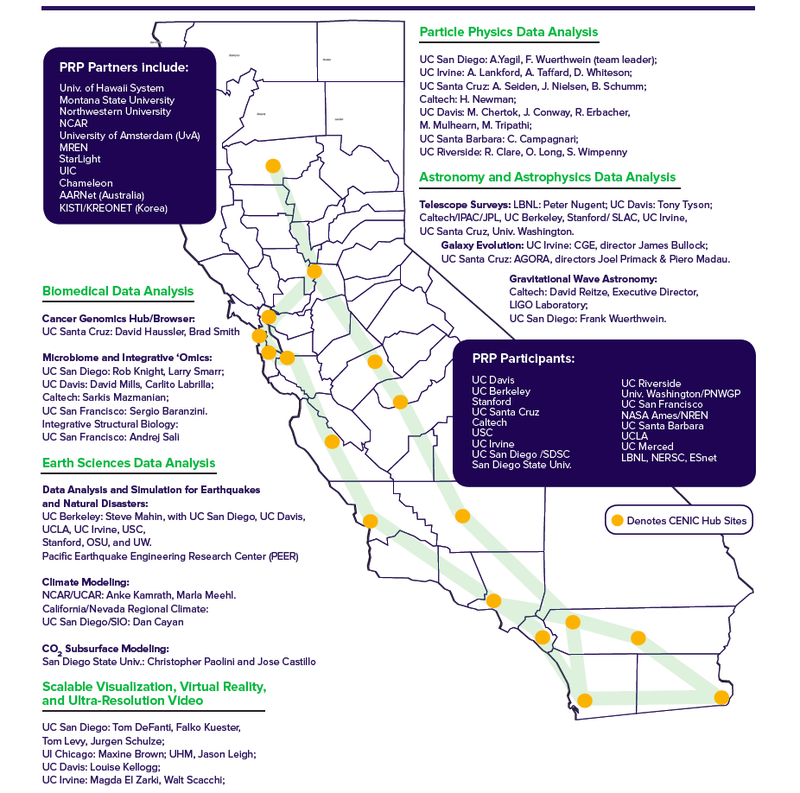 The California network of UC campuses and partners in the Pacific Research Platform and the scientific research application teams to be linked to the PRP, including partners at other PRP sites on the West Coast. Q. How big of an effort is the PRP in terms of researchers and institutions? SMARR: There are over 50 frontier researchers who have signed commitment letters as part of the PRP grant, but there are also such letters from the Chief Information Officers of the participating campuses, as well as national laboratories that are linked in as well. So it’s a very large-scale collaboration of more than 20 institutions and probably close to 100 individuals. While I am principal investigator, the real work of bringing the PRP into being has been done by our large team of very talented people drawn both from network engineering and from Big Data research. This project cannot be accomplished with just the money in the NSF grant and I’ve been very pleased to see the level at which all of the participants have stepped up to the plate to contribute. For instance, because the core of the PRP is the ten-campus UC system, the UC Office of the President provided vital ‘momentum funds’ to enable our team to get started, while waiting for the NSF review process. Q. This is also a partnership between Calit2 and CITRIS, two of the Gray Davis Institutes for Science and Innovation on University of California campuses. What brought you together? SMARR: The 15-year history of the four Gray Davis Institutes within the UC has helped us understand how to better manage these large multi-institutional projects. Just as Calit2 is a southern California UC San Diego/UC Irvine partnership, CITRIS is a northern California, four-campus institute led by UC Berkeley. Both Calit2 and CITRIS have worked on large-scale IT/telecom systems, so it was natural to ask CITRIS to become a co-developer of the PRP, with CITRIS Deputy Director Camille Crittenden serving as one of the co-PIs.. And although the PRP grant itself is joint with CITRIS and Calit2, the other two Gray Davis Institutes, QB3 and CNSI, have expressed interest in helping, particularly with their five UC campuses, to fill out the PRP. So in many ways, just as the PRP could not have existed without CENIC, it may also not have existed without the Gray Davis Institutes of Science and Innovation. Q. Why is it possible in 2016 to undertake the PRP? SMARR: From a networking perspective, the PRP is only possible now because the NSF has funded on-campus cyberinfrastructure for the last four years. The PRP became the next logical step, system-integrating the member-funded CENIC backplane infrastructure with the NSF-funded campus cyberinfrastructure. Our job was to identify and bring together early adopting, multi-campus research teams with the top network engineers on the West Coast. In doing so we had to create end-to-end networking from data producers to data consumers. To do that required crossing network management boundaries -- CENIC manages the wide-area networking up to the campus gateway, the campus CIOs and their staff manage their respective campus networks, and often the departments have to manage the networks within the buildings. Having an end-to-end capability may drive a reevaluation of how best to manage these larger-scale scientific networks, and that is part of this socio-technological experiment. Calit2 Director Larry Smarr is principal investigator on the Pacific Research Platform project funded by NSF. Q. Since the PRP was announced in August 2015, what has been job #1? SMARR: In each year of the five-year PRP, we will connect more and more of the application teams. It’s important to start with just a few, so that you have a rapid prototyping environment and we can sort out the technological challenges and be more prepared to scale in the later years. So we are looking at the teams that are most ready to engage and that have a need now for the higher bandwidth to connect their existing multi-campus teams. We are also finding a number of new opportunities that were not included in the original grant. Various groups have approached us after seeing all of the publicity about the PRP and we want to bring them into the PRP where possible. Q. What’s the biggest technical challenge facing the PRP? SMARR: The good news is that the backbone and the piece parts of the campus network were already available. The bad news is that creating a uniform network fabric out of them is a detailed engineering task that requires high levels of expertise in how to measure and modify networks. We have had a large team of network engineers, drawn from the campuses, CENIC and ESnet, having weekly conference calls for 12 months, so that should give you a sense of the technical challenge we are facing. SMARR: I’m looking forward to CENIC 2016 next week, where we’ll be able to have detailed conversations with a number of existing teams. 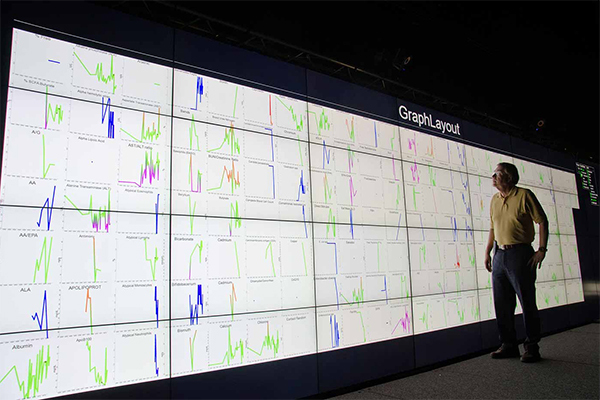 While the PRP seems large-scale and complex, it is meant as a simple, worked example of a new mode for developing specialized, high-performance infrastructure to support multi-campus research teams. So getting the word out to a broader audience through events such as CENIC 2016 is a key part of what the PRP is supposed to be doing.